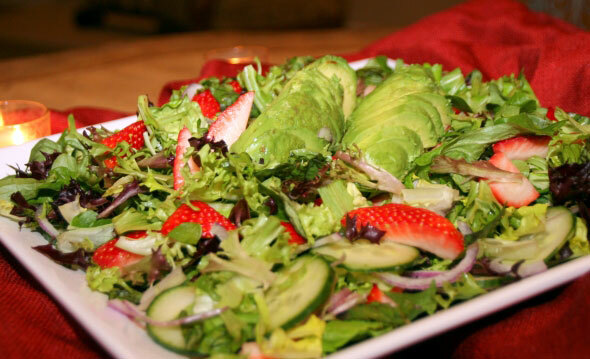 Strawberries make a wonderful addition to this refreshing salad. The ingredients are simple and you can toss the salad together in minutes. Just combine your favorite mixed greens; I used a variety of artisan greens, spinach and fresh basil for an aromatic taste; with sliced red onion, cucumber and quartered strawberries (fraises are a good choice). Finally, add creamy avocado slices for a finishing touch. The Tarragon Mustard Vinaigrette dressing is one that I use often for many salad combinations. It’s herby and slightly tangy flavor completes this salad and makes a pleasantly savory addition. Enjoy! Strawberries are a popular fruit that make a refreshing addition to this simple mixed green salad. The Tarragon Mustard Vinaigrette is pleasingly complimenting and creates an unexpected savory flavor! Toss mixed greens, basil, red onion, cucumbers and strawberries in a large bowl or platter. Fan sliced avocado on top of salad. Serve with Tarragon Mustard Vinaigrette.